What is the number one reason that people visit their doctor? The answer may surprise you. According to a recent survey done by the Mayo Clinic, it’s not back pain (that’s #3) or respiratory issues (#5 on the list). It’s for skin conditions- whether it be a rash, acne or other skin disorders. I find this interesting because skin disorders/itching is also the #1 reason pet owners schedule appointments for their pets at the veterinarian. Some breeds are prone to skin conditions, like bulldogs and Labrador Retrievers (among others), but all breeds can be easily affected by the pesky little flea. The majority of itching/skin issues we see are caused by these tiny parasites. More than 2,000 types of fleas have been classified around the world, but the little pest that we can commonly see bothering our pets is actually known as the cat flea- but they don’t care if their host is canine, feline or even a rodent. Fleas survive on meals coming from their host- which is your pet’s blood. When the flea bites your pet, they leave saliva behind- and many pets are allergic to this saliva. This is known as flea allergy dermatitis, and usually develops in young pets, but can develop at any age. 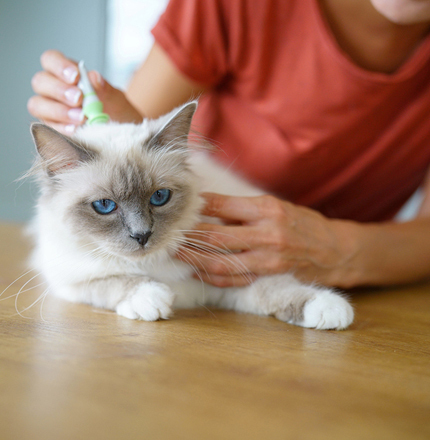 Even if your pet does not develop an allergy, flea bite hypersensitivity is very common, and can cause your pet to scratch their way to discomfort. If your pet is hypersensitive, or has flea allergy dermatitis, just one bite can send them into a tizzy! This is why the consistent, year round use of flea prevention is so important. The best way to protect your pet and your home from a flea problem is with a good prevention protocol. Speak with your veterinarian about what flea prevention product is best for your pet based on your pet’s lifestyle. There are lots of great products out there, both topical and oral, some which last up to 12 weeks. Not all products are created equal, and some protect against more than fleas and ticks. Some provide protection against mosquitoes, mites and other parasites, too. My Pet Has Fleas! Is prevention enough? The honest answer is- it depends. Flea prevention products for your pet are meant to either kill live fleas, or ultimately interrupt the flea’s life-cycle. Some prevention products don’t kill live fleas, they simply sterilize the flea- preventing them from reproducing. If there are enough adult fleas in the home environment, then it is likely that you have flea eggs hiding out in tiny nooks and crannies where your pet hangs out. They may be in the carpet, or in the tiny cracks of your hardwood floors, or any other small, dark crevice. Flea eggs are tiny, smaller than a grain of sand. An adult female flea can lay up to 40 eggs per day. 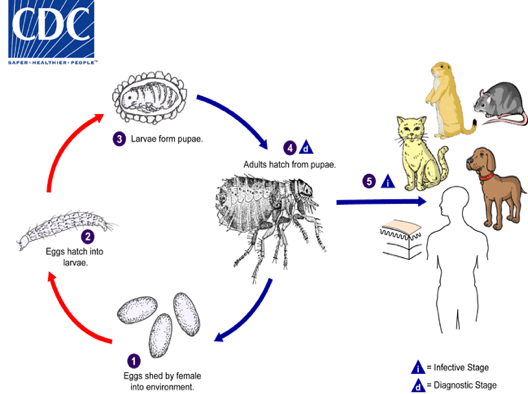 In a flea-favorable environment, the eggs will hatch into larvae, then emerge into pupae. Fleas can remain in the pupae stage for months, waiting for the right conditions to hatch into adult fleas. The CDC has created this simple, but compelling diagram explaining how this process takes place. If you are troubled by an infestation of fleas, giving your pet prevention products will not likely solve the issue. But, don’t panic! It can happen in any home. Just know that it will be necessary to treat the environment, usually both inside and outside the home. There are a number of products out there, which are environmentally friendly. Many of them contain Boric acid, which basically dehydrates the eggs, larvae and pupae in the environment. Of course, if you choose to do this yourself, carefully follow the manufacturers instructions. Q: My cat never goes outside. Why do they need flea prevention? A: You would think they can’t get fleas if they don’t go outside, but that’s not true. Fleas are tricky little pests, and can travel well. You may not know it, but you may actually bring them in your house from your yard. If you interact with another person’s pet who has fleas, one may hitch a ride on you into your house. Eventually, it will find it’s way onto your cat. We have seen indoor-only cats infested with fleas more often than one would think. Q: My pet has skin conditions not related to fleas, and I need to bathe him regularly. Does a topical flea product still last 30 days? A: Most do, but it depends on the frequency of bathing. If you’re concerned about this, we would likely suggest an oral prevention. Bravecto protects your pet for a full 12 weeks against fleas and ticks. Q: Is it OK to give both topical and oral products to protect my pet against fleas? A: In most cases, yes. Although it is rarely necessary, and is certainly doubling your cost. Consult your veterinarian to ensure the two products do not have any interactions- but most products can be used at the same time. What other problems can fleas cause? Some fleas can also spread intestinal parasites, namely the tapeworm. Your pet must actually ingest the flea- which happens when your pet is chewing/biting at the biting pest. If the flea is carrying tapeworm eggs, your pet may get tapeworms if they are not on a product that protects against tapeworms and other intestinal parasites. A severe infestation of fleas can also cause anemia in pets. Believe it or not, we have seen cases where hundreds, if not thousands of fleas have caused a pet to lose so much blood they become gravely ill. Most of us have watched a cat or dog furiously scratching itself. If this behavior continues and increases to the point that the pet is scratching during most of its waking hours, it can be a heartbreaking sight. 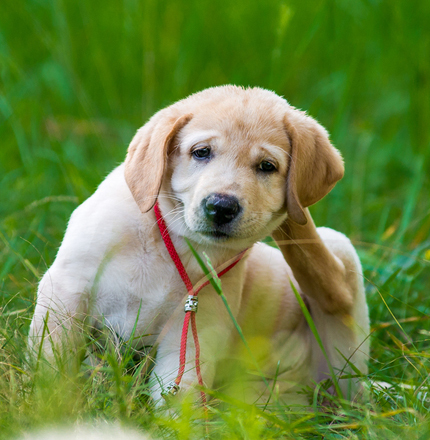 There are various reasons for a pet’s scratching, and the most common (and usually easiest to treat) is flea bites. Both fleas and ticks pose serious problems for our pets. Not only do these insects cause skin irritation, they also can put your pet’s overall health at risk in ways you may not be aware of. Fortunately in the Tampa area, where it is always flea season (even in the coldest of Florida winters), we have some very effective treatments to rid your dog or cat from an invasion by these pests. While ticks are most often found in wooded areas, they regularly show up in a variety of other places. When they show up on a cat or a dog, they go right to work consuming the animal’s blood. Because ticks can ingest up to 100 times their weight in blood, a sizeable infestation on a pet can lead to anemia and other serious conditions. The biggest danger with ticks, however, is that some of them carry diseases that can be transmitted to a house pet. Among the most common diseases is Lyme disease, a bacterial infection that is known to cause rashes, headaches, heart palpitations and even partial facial paralysis. Rocky Mountain Spotted Fever also can be spread by ticks. This disease has many of the same symptoms as Lyme disease and may be fatal without proper treatment. I always suggest putting your pet’s prevention schedule in your calendar. Whether you use a smart phone to manage your appointments, or a calendar hanging in your home- mark the dates each month that your pet is due for their flea prevention products- so you don’t forget. I’ve seen many pets whose parents have forgotten a month, and next thing you know- there’s a flea problem. Some manufacturers even have apps for your phone that will remind you. We carry a wide variety of both oral and topical prevention products, as well as products that can treat your home environment to prevent these little pests. Ask us which product will be best for you and your pet on your next visit.